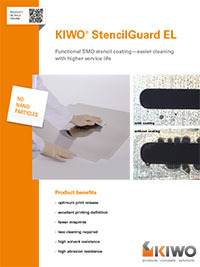 This newly developed and widely used product effectively removes colophony, fluxing agents and degassing residue from printed circuit boards without attacking surfaces. 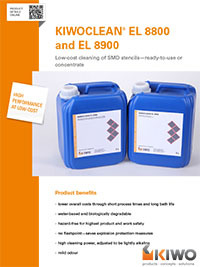 Spray KIWOCLEAN EL 9100 onto the surface and let it react for a short while, then remove with a cleaning tissue. 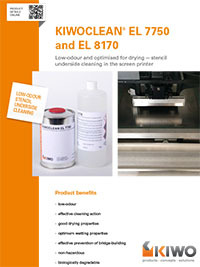 Usually there is no necessity to rinse e.g. with water afterwards. 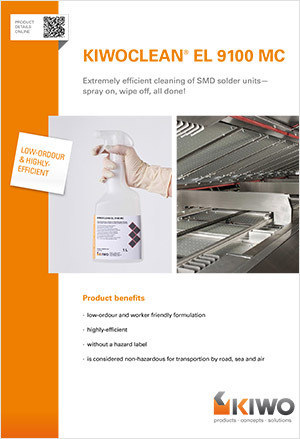 Apart from cleaning effectiveness, our product development specialists placed particular emphasis on a low-ordour and worker friendly formulation. 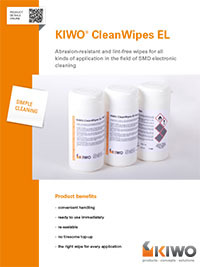 KIWOCLEAN EL 9100 comes without a hazard label and maintains work safety in production plants. 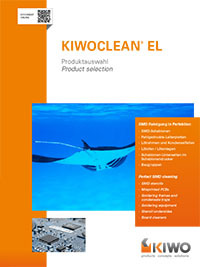 Furthermore, KIWOCLEAN EL 9100 is considered non-hazardous for transportion by road, sea and air and can therefore be shipped easily. 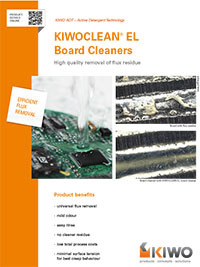 The excellent product features of KIWOCLEAN EL 9100 have been tested and confirmed by leading manufacturers of soldering furnaces. 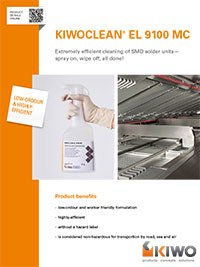 KIWOCLEAN EL 9100 is supplied in an original box of 12 x 1-litre spray-bottles and two spray nozzles.